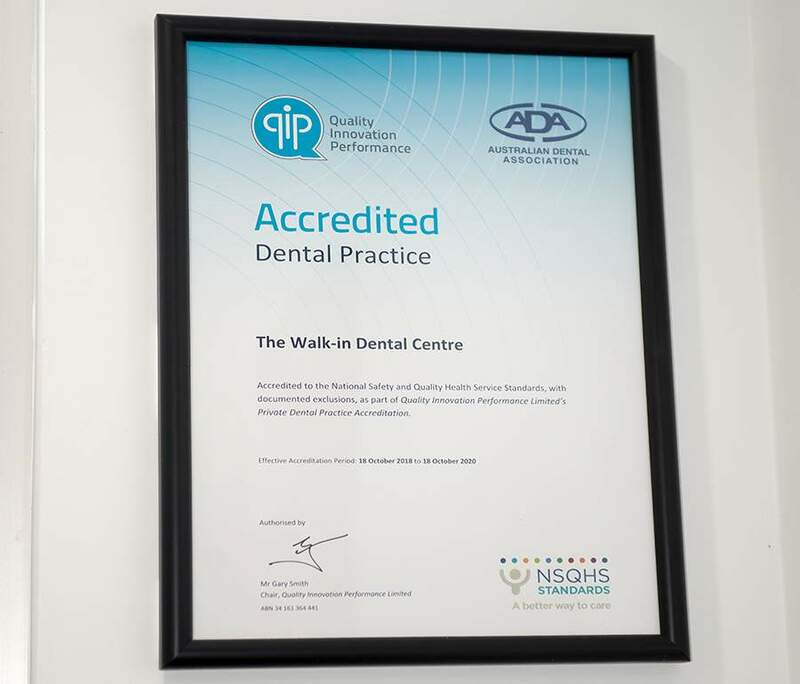 The Walk-in Dental Centre are proud to announce we are an accredited dental practice! This is to provide our patients with peace of mind, ensure their safety and quality of service. Being an Accredited dental practice enables us to demonstrate a culture of quality and patient safety. There’s a commitment to safety and quality: Every decision made by our dental team considers your safety and works to ensure a high quality of service. You can provide feedback: Accreditation means this practice welcomes your feedback, whether it’s good or bad, in the interest of making things the best they can possibly be. Your healthcare rights are protected: At this practice you have the right to access care, to safety, to be shown respect, to be informed, to be involved in decision-making, to your privacy and to provide feedback. You can rely on our team: Our team works together to look after you in all aspects of your dental care. You can talk to any one of us about your care and your concerns. Your privacy is protected: Measures are in place to protect your privacy, your information and data, and systems set up securely to store this information. You can ask for information: Our dental team see you as a partner in healthcare. We will arm you with the information necessary to make the right decisions about your health. You can see what we have achieved: The process of achieving accreditation is voluntary for dental practices. We have invested in the process of reaching and maintaining the highest safety and quality standards. Ask to see our certificate of accreditation. You can be confident: This dental practice has systems in place to continuously improve in everything we do.